When it comes to fitness bands, Fitbit is the name to beat. But with new smartwatches from Apple, Google, Microsoft, and Pebble all touting some degree of activity tracking, the company knows the competition comes in more forms than the bracelets Misfit and Jawbone strap onto the wrists of athletic people. Fitbit has experimented with watch-like devices for a couple years, starting with the Force, which was ultimately recalled. Fitbit replaced that product with the largely identical Charge. Now it's making a smartwatch that looks less like an activity tracker and more like the Asus Zenwatch or the Apple Watch. This upcoming device is called the Fitbit Blaze. Before you get too excited, this won't be an Android Wear device. Fitbit's main selling points include FitStar personal trainer workouts with an 8 minute warm-up session, the 7 minute workout, and 10 minute abs. These wouldn't have worked on the small, OLED displays found on the Force and Charge. The Blaze includes software for tracking biking, hiking, running, lifting weights, and yoga as well. On the hardware front, there's built-in GPS (edit: the Blaze uses your phone's GPS) and heart rate monitoring. Batteries should last up to five days on a charge. All of this is in addition to the standard fare, like accepting calls and managing music. 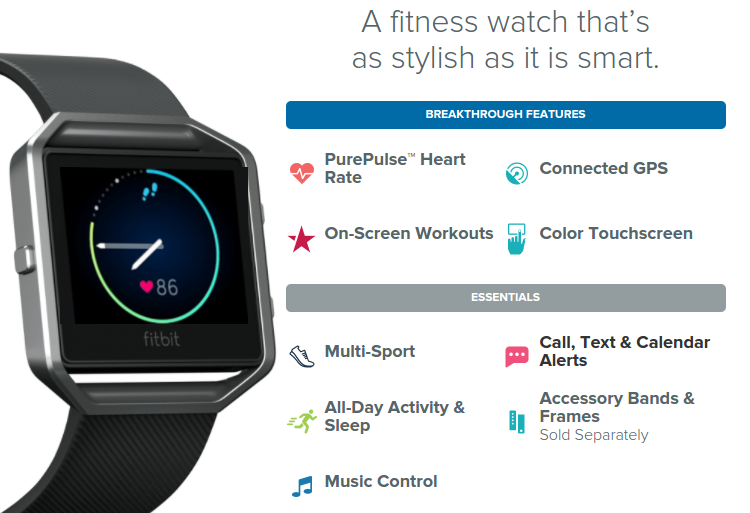 Notably, Fitbit's smartwatch offers compatibility with Android, iOS, and Windows. The Blaze is square, and has nearly as much bezel on the face as screen (along with a logo underneath the display). Wearers can pretty up the device by swapping out $29.95 plastic bands (black, blue, or plum), $99.95 leather bands (black, grey, camel), or $129.95 silver stainless steel bands. The watch itself will cost $199.95 when it launches in March. Folks will be able to try devices out in stores at select Best Buy locations starting February 20th. Those who like what they see can place a pre-order on the spot. Or you can head to the website and place one now. FitStar Personal Trainer on-screen workouts deliver guided instructions and animated images to three of the most popular personal trainer workouts from FitStar: Warm It Up (8 minutes), 7 Minute Workout, and 10 Minute Abs. Each workout is free and can be accessed at any time with no app or smartphone required, offering a fast, effective workout you can do anywhere. Connected GPS helps you train smarter by delivering real-time exercise stats like distance, pace and minute-mile split times when connected to a smartphone’s GPS. After each workout, stats sync wirelessly to the Fitbit dashboard to let you review your route, speed and elevation in more detail. PurePulse continuous, wrist-based heart rate tracking helps maximize any training routine with simplified heart rate zones to help you maintain workout intensity and better track calories burned during each workout. PurePulse also provides all-day insights into overall health, including resting heart rate and heart rate trends over time, all without an uncomfortable chest strap. Multi-sport mode lets you record specific activities like biking, cardio, running, weights, yoga and more while providing relevant, real-time performance stats to help you get the most out of each workout. PurePulse is enhanced while in Multi-sport mode for even better heart rate tracking, especially during high intensity workouts. SmartTrack automatic exercise recognition automatically recognizes and records continuous movement activities like biking, hiking and running, with general categories for aerobic workouts (i.e., Zumba®, cardio-kickboxing and other dance classes) and sports (i.e., tennis, basketball and soccer). It gives you more ways to stay motivated and get credit for your workouts by effortlessly recording them in the Fitbit app and automatically adding them toward weekly exercise goals. Premium interchangeable bands made from genuine leather, stainless steel and high-performance elastomer to let you design a look that’s extremely personal and a perfect fit – whether at the gym, in the office or out on the town. A unique modular design that allows you to easily remove and insert your tracker into a new frame, so you can wear Fitbit Blaze with style at work and then swap it instantly into a new frame with a workout-friendly wristband. Use the quick release spring bars to switch your bands and change the look of your device in seconds. Fitbit’s first vibrant, high-resolution, color touchscreen and multiple clock faces make the device uniquely yours and distinguishable from others. Stay connected with smart notifications you need. Fitbit Blaze features the smartphone notifications you need most instead of being overwhelmed with unnecessary information. Track your night with automatic sleep tracking to know how long and well you sleep, plus set a silent alarm that gently vibrates to wake you. Long battery life of up to 5 days on a single charge lets you live your life and track your exercise, sleep and heart rate day and night, with the confidence you won’t lose a step or miss a beat. Compatible with more than 200 Android, iOS, and Windows mobile devices so you can access stats and motivational interactive tools, which help to motivate millions to achieve their goals within the community of Fitbit users they choose. Consumers who want to experience Fitbit Blaze in person will be able to do so in advance of in-store retail availability at select Best Buy locations in the United States and Canada. Beginning February 20, visit select Best Buy locations where Best Buy Blue Shirts will be available to assist shoppers with trying on the device with its accessories and to complete a preorder. By combining the power of technology with insights, Fitbit offers a wide variety of connected health and fitness devices that help people at the everyday, active and performance fitness levels pursue their health goals. 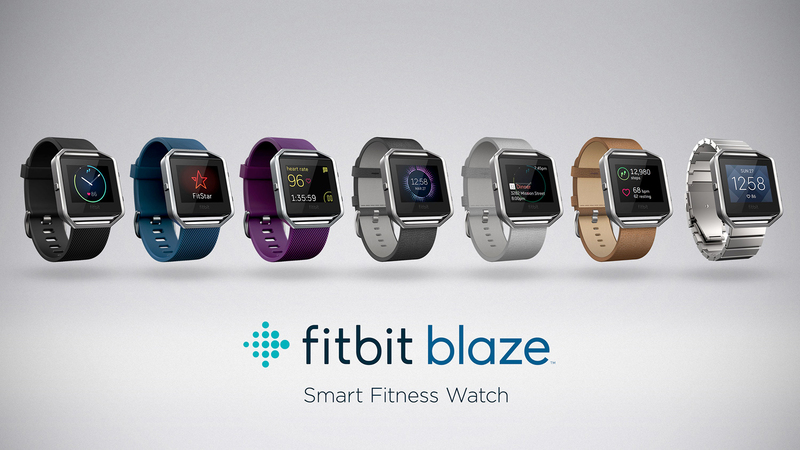 Visit the Fitbit booth to see the new Fitbit Blaze and experience the entire Fitbit family of connected health and fitness products - Tech West: Sands Expo at The Venetian, Level 2, #74108. For more information on Fitbit products and services, please visit www.fitbit.com.